This note summarizes the results of several conversations on the Yahoo 3500 Group concerning aircraft crash locations in the Catskills. The contributors to this include Edward Ripley-Duggan, cycleslug, Dan and Elizabeth Case, David Galvin, Mike Selender, Alex Flegontov, Elie Bijou, and Matthew Rignanese. In addition, I have incorporated additional information from Daniel Ginsburg, Rich Van Kleeck, Kenneth Bernstein and Tim Cox. If you want to see the original comments, go to the Yahoo archives and search for "crash". It also includes information and pictures gleaned from the webiste geocaching.com, where a number of aircraft crash sites are listed as geocache locations. Note that I have not been to most of these sites myself, and the descriptions and pictures are usually not my own, but those I have gleaned from various web sites. The use of the first person below does not represent me, Charles Hayden, but rather one of the contibutors listed above. You can read about my own trips to these crash sites in the following hike descriptions. The GPS coordinates I have managed to collect from various sources, including my own observations and several geocaches. Some of these are omitted in the interests of preserving the lesser-visited crash sites. Near Escarpment Trail. I don't know what year this was. Small passenger plane out of Albany on foggy night that couldn't maintain altitude. This remarkable promontory has claimed more lives than just John T. Grace, who perished when the Piper PA-28 he was piloting (N1316T) crashed in foul weather next to the escarpment trail on May 26th, 1983 (Memorial Day weekend). He had taken off from Poughkeepsie at 9:12 A.M., heading for Watertown against the advice of several other pilots. He filed no flight plan and had only a revoked student pilot certificate. He impacted within a few feet of the top of Stoppel Point at 9:40 A.M. I visited and photographed the site in September of 2003. There is another crash near Stoppel Point. This one claimed 6 lives and occurred on December 15th, 1989. A Piper Navajo (aircraft registration # N45CH), piloted by Timothy Burns was headed from Glens Falls to Montgomery, NY, heading down the Hudson, when he hit the front edge of the first big snowstorm of the season encountering blizzard conditions (just after dark) and continuing VFR flight while veering too close to the west and slamming into the northeast side of Stoppel Point at 2800 feet. The crash is accessible from below via Winter Clove, but is a very strenuous climb around boulders and very steep cliffs of the escarpment. It is one of the most difficult bushwhacks I have ever undertaken. I visited and photographed this site in May of 1994. Although I attempted originally to reach the crash site from above from both ends of Stoppel Point, this proved too treacherous. I returned and eventually found a better way up via Winter Clove (northeast of Stoppel Point). I followed the stream up past the waterfall and then traversed to the north at about 2,800 feet after spending much time getting around boulders and cliffs on terrain at a 45 degree incline. The recovery operation must have been amazing (I was told by rangers years ago that a team of state troopers and DEC rangers went in after this (fatal) major snowstorm to recover all 6 bodies from the wreckage, and they had to winter camp overnight after roping down from above). Tim and I went to high school together in Hamilton twp. NJ (Trenton). And remained friends after. We went flying quite often. Me mostly just for the ride. I knew him to be a very accomplished pilot, but the crash was ruled pilot error because of his decision to fly that evening. I read the initial NTSB report and had a few other friends who flew with him from time to time. One of the big deals with the crash was that the FAA/NTSB, I believe, ruled that the flight was regarded as an illegal charter flight. I remember his father now deceased saying that they pretty much flew into the mountain at full speed. 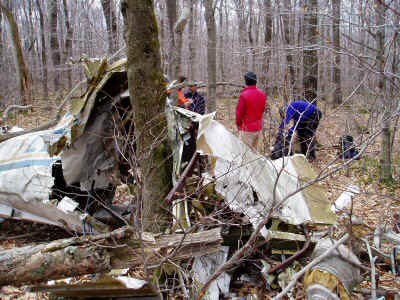 This is "Air Crash 6" on geocaching.com. I found this one through a bit of human intelligence at the park. If you find more of the aircraft than the bits around the wing, let me know about it. 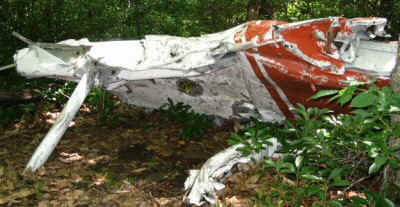 This appears to be the remains of a Cessna. I read of one that encountered a downdraft in the area and couldn't climb fast enought to avoid a crash. 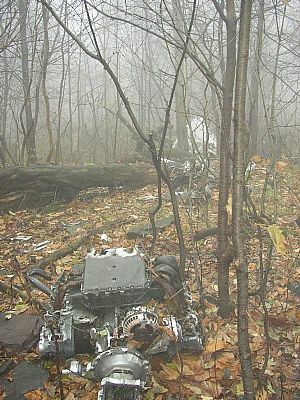 This is "Air Crash 1" on geocaching.com. At SE corner of snowmobile loop. Small passenger plane, 1977. Howie Dash can tell you a nice story about the day after this happened. Located on the side of a mountain at 3,080 feet about 3 miles from the nearest trailhead if you bushwhack the last quarter mile. Easily reached by snowmobile in Winter. This plane was so badly fragmented that the only sign of the cockpit was the flight control mechanisms. The path of flight can be gleaned by examining the debris field. The engine is at one end and small pieces are at the other, further down the trail. This Piper PA-32 (aircraft registration number N7146C) was an air taxi cargo flight which actually crashed on June 25th, 1987 wth 2 fatalities. Probable cause of the crash was determined to be clouds, darkness and pilot flying VFR into high terrain. 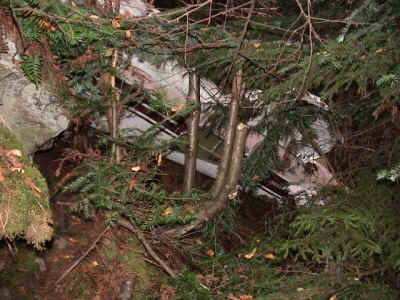 This is "Air Crash 3" on geocaching.com. Closer to cliffs east of summit. Some wreckage placed at summit clearing. On top of a 3,655' mountain. Very steep trails. This was the hardest to find. I thought there may be an aircraft here when I found the crankshaft for an engine laying in the woods on the summit. "Hmmm...", I said. "What the heck is this doing here?" I'll come back and look again. Use trailheads at Kaaterskill Clove or Devil's Kitchen. Hike can be challenging both up and down. Be careful. At times the trails are near vertical. Go to the coordinates N 42° 09.734 W 074° 04.829 , then project a waypoint to 080 degrees, at 495 feet. Located at 3,420 feet. A climb of 1,170 feet and a 4 1/2 mile hike each way. Allow 5 1/2+ hours in good weather. The recommended trailhead is SSE of the site. This aircraft remained fairly intact. The engine was removed for the investigation. How did they get it out of here? The critters like to chew on the exposed edges of aluminum. Hmm... I suppose they suffer from a mineral deficiency. The crankshaft at the KHP summit is from the wreck which is 495 feet from the summit markers. This is the oldest civilian wreck I know of in the Catskills. It occurred on June 13th, 1967. This Piper PA-23 (aircraft registration # N5604Y) was flown using VFR into adverse weather conditions attempting to clear the summit without success, resulting in 2 fatalities. The trip to the wreck from the summit is not that far, but the Balsam is thick and painful. I reached and photographed this site. There is a debris field that can be seen in fall/winter from the ledge on Overlook. My friend and I bushwacked down from that point last year about forty-five minutes and to our surprise we came upon the main fuselage of a Cessena that appears to match the debris up mountain. The question is : Why is so much debris on the top of the mountain and the main components (cockpit parts as well)of the plane so far down slope? When I looked at the crash data, this plane went down in 1984 with one fatality. As far as where this is specifically, we bushwacked straight down from the overlook ridge and emerged in Lewis Hollow. There are possilby two crash sites on Overlook. 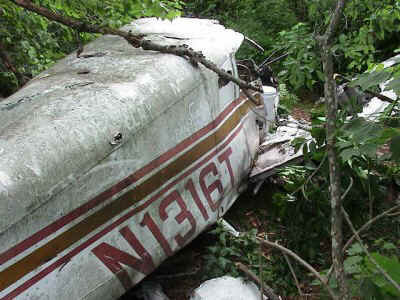 One is a CESSNA 172B Reg: N8213X NTSB Report:NYC65A0117 Crash Date: 3/17/1965. This bizarre crash occurred on May 2nd, 1963 over the reservoir when two F-105 Thunderchiefs flying from Republic Aviation on Long Island collided during a test flight, killing both test pilots. One of the test pilots was Jack Bade, a celebrated WWII flying ace with the 44th Fighter Squadron. The other pilot was Don Seaver. Supposedly another WW II trainer somewhere on the mountain, very little left of wreckage now. This one is pretty easy to find when the leaves are down, about a hundred feet off the loop trail. It's a small, crude, two-man trainer probably from WWII. It's a little tough to spot because of its small size (about that of a Piper Cub) and the color (olive drab and tarnished aluminum with patches of lichen). I have no details on this crash, but would guess it came down a long time ago. The crash is at N41 55.606 W74 17.902. This area is located on the loop trail, there is a long flat section and then the trail descends very steeply. The crash is located about 100 yards before this drop and is about 100 feet off the trail. Looking at the maps of the hiking trails, it is a bit before the 90 degree turn and well after the 180 degree turn in the loop trail. Far off trail on ridge above Ox Clove. February 1987, doctor from Roanoke, Va., killed along with his family while flying to Vermont for ski weekend. Wreckage only found by CAP cadets out of Albany when snow was all melted in early May. This weekend we were hiking Balsam Cap/Friday from the steep eastern side, from the Moonhaw/Shultis Rds. Coming back down we came across the wreckage from a plane crash in the hollow. Has anyone else seen this same plane wreck? I haven't read anything mentioning it anywhere, and wonder how long ago it happened, or other details that you might know. The plane is indeed a B-25 Mitchell medium weight bomber, commonly used in WWII. You can google it to see what it looked like, or rent Mike Nichol's film version of _Catch 22_, which features them abundantly. According to information I have gathered, The plane in the eastern cirque between Friday and BC crashed in 1944 during a night training session. Apparently, a navigation error caused the pilot(s) to veer off their planned course over the Hudson River, and the low-elevation flight ended when it met the relatively high elevation Burroughs Range in the dark. In the icy technical language of air disasters, this is called "controlled flight into terrain." Much of the plane survives, although in a scattered and smashed condition. Porcupines have been working on the aluminum for sixty years, but it will take a long time for them to grind it all to dust. One can still make out the old "stars and bars" insignia of the U.S.Army Air Corps on the wings, and the tailgunner's position is still discernable. The engines and wings are somewhat downhill from the main fuselage, and there are bits of plane over a wide area. Not surprisingly, the forward part of the fuselage, which included the cockpit and bombadier's station, is completely destroyed. Of course, all weapons, munitions, personal effects and body parts were removed shortly after the accident. I have visited it once. If I remember correctly, it is at roughly 2800 feet in elevation and is below the view ledge area on the route between the two peaks. I don't have the history on it. I don't remember coming across it on our descent from the peaks via that route in 1999. I did see a piece of it, though. Dave Galvin tells me that although even though it's referred to as the Balsam Cap crash, it's actually decidedly on the Friday side of the drainage. The Friday site is actually at between 2600' and 2800' elevation in the eastern cirque between Friday and Balsam Cap, but nearer to Friday. Most of the plane lies in a gully and, being a W.W.II bomber painted grey and olive drab, is difficult to spot. This is by far the most difficult site to access and find. Most people who have found it have gone down from the col or from Friday Mountain through the drainage, a nasty and treacherous descent. The B-25 Mitchell Bomber in the drainage crashed on the evening of March 31st, 1948. Its USAAF tail number is 44-29215. It rolled off the assembly line on September 9th, 1944 and saw action over France during WWII before coming back as a trainer. It was flying just such a training mission in 1948 when navigation errors led the crew to believe they were flying over Newburgh preparing to let down at Stewart Airfield, when in fact they had been over Kingston and were headed straight towards Friday mountain (3694'), impacting at 2,700 feet elevation and bursting into flames. The pilot was Captain Richard B. Willis. Two other crew members were aboard and all perished. I visited and photographed this site in June, 2005. Lower portion of ridge. USAF jet crash. The USAF T-33A training jet (tail number 55-4402) was just an hour out of Stewart Airfield on November 1st, 1962 when Lt.Colonel Carl Colson and Captain Russell Johansen perished when they lost control of the aircraft while they were practicing acrobatics during testing. The single engine jet was manufactured by Lockheed Martin in 1955. I visited this site along with the other crash on Van Wyck in November, 2004. Van Wyck Mountain, midway up summit ridge from Bull Run. Small passenger plane crashed in 1978, plaque at site, wreckage can sometimes be seen from Great Southern Overlook on Peekamoose when leaves down and sun angles just right. There is a small plaque on a nearby tree with a few of the crash details. Canadian Air Force crash, all materials extracted. On Gould property line. Civilian. At roughly 3,760' on SSW slope of summits. 1982, passenger plane that hit mountain in level flight at night. Continuing south, I turned at the herd path for the Doubletop-Big Indian col. I descended the eighty feet to the airplane crash site, which was difficult to find in the thick, changing foliage. I took a couple of pictures of the two-engine Beechcraft's remains and continued down. This Beechcraft Baron 58 (aircraft registration number N6657R) was flown by Granville Bentley, a pilot with the now defunct Catskill Airways, returning to Margaretville from Atlantic City after dropping off 2 passengers. He crashed as a result of severe downdrafts during a late summer thunderstorm on the afternoon of September 21st, 1983. Second crash not located. Military?? There is a plane wreck in the woods off the Escarpment Trail between Boulder Rock and the old Hotel Kaaterskill site, where the trail curves a bit. Two friends of mine did a bushwack to Panther mtn from Slide Mountain Road from the south fork of the Hatchery Hollow stream(?) just south of the private Hatchery Hollow Rd. My friend was told by the daugher of the ex-fire chief of Oliverea about a jet (military trainer) that crashed on Thansgiving day in 1957. She spoke to her father who marked an X on a topo map at about the 2800' just due east of where the south fork "ends" on the topo map but before the Giant Ledge/Panther trail from fox Hollow road. Does anybody know any more detailed info on the location/existance of this wreck? Three of us did a hike by spotting a car on Fox Hollow and then leaving from CR47 by Hatchery Hollow road, bushwacking on state land down the Hatchery Hollow, then turning right to follow the south fork (and also state land). Cross the side stream as marked on the topo map and heading pretty much due east up the stream towards Panther. We got to about 2400' where the USGS map (and TC maps for that matter) show the stream is sourced. However, the map doesn't show that the stream is fed via both the gulleys from the north and the south. The topo map shows the gulleys but they don't show the streams that we found. The X that we had on our map was immediately above this area at around approx. 2800' At this point the three of us, simply fanned out to look for the 20' crater that was supposedly left. As far as we know, the plane was not removed. Anyway, did not find plane although without radios and only three of us, we could not cover too much an area and we covered mostly the south branch. There is areas on the north branch that we'd like to check out. Does anybody know anything about this. I was going to contact the region 3 DEC ranger Charles K since he is the ranger for Panther and also my ranger for the Curtis Ormsbee trail I just volunteered to Adopt. Have to talk to him anyway for my maintenance duties. Is is possible that perhaps my friend's coworker's father marked the wrong stream as if you look on the TC map, there are like three streams that head east towards Panther, the north fork of the Hatchery Hollow, the south fork which we went up, and a stream below that (forget the name now). I've been there a couple of times during hunting season. There is actually a jeep trail that goes almost to it. You can walk up a road behind the Slide Mountain Forest House to the crash site. The jeep access is through a hunting club that bought some of there land and they give hunters from the resort seasonal access but can be walked from behind the hotel. There still is alot of wreakage including engines and one ejector seat. WW II trainer said to be on east side of mountain a few hundred feet from trail at 3,600'. Supposedly there's a herd path. Slide, somewhere at about 3,600', via faint herd path from trail up steep east face, according to Mike Selender. This is another old bomber. As a reporter in 1977, I was asked to research a B-17 crash in August 1947 on the east slope of Slide Mountain. One of the crewman's sons wanted to locate the wreckage. We managed to find the Sheriff at the time, a man named Kavanaugh, and he gave us a rough location and elevation (I think it was 2,800 feet). He had led a search crew who removed the bodies. I have additional information in my files, including maps and a vague, original newspaper account of the crash if anyone is interested. A weekend expedition located the wreckage, but I have no photos. The file sort of languished in my desk for 30 years and I recently found it. 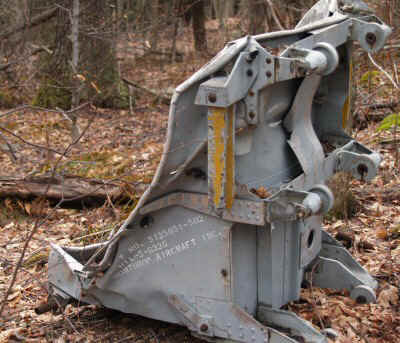 I wondered if anyone cared, then I read the sketchy report of an old military crash on Slide Mountain on your website and wondered if it was the same one. I interviewed an 8th Air Force B-17 pilot from WWII and he suggested that Aug. 1947 was during a drought because the B-17 altimeter didn't work very well in dry weather and 2,800 feet could be read as 28,000.